Although the Prince enjoyed showing Lillie off, he decided that he wanted to have somewhere that they could get away from prying eyes where they could relax and be themselves. He bought a plot of land in a secluded area of Bournemouth's East Cliff and told her that she could design a home for them. Where others would have preferred jewellery and gowns Lillie was very practical and considered land and property to have lasting value. Lillie enjoyed designing the romantic royal lovenest, adding personal touches. The foundation stone shows ELL (Emilie LeBreton Langtry) and 1877. The kings chamber had a lofty ceiling specially designed to disperse his cigar smoke. The walls featured original paintings and their love of the theatre was reflected in the huge carved oak fireplace which featured hand painted tiles with scenes from Shakespeare in blue and white enamel with gold leaf. On the outside wall of the Kings room the motto 'Dulce Domum' Sweet Home and on the other side of the building 'Stet Fortuna Domus' (may fortune attend those who dwell here). Lillie was determined to stamp her personality on the building, on entering her friends would be welcomed with the greeting 'and yours my friends' meaning this is your home too. No royal retreat would be complete without a magnificent dining hall. Lillie hated dark wood and as in the rest of the house the wood was painted the new white enamel. Beneath the minstrels gallery a self explanatory statement for all to see ' They say What say they? Let them say'. Carved into the inglenook fireplace ELL and in the stained glass window lovers swans. Lillie didn't want to leave anyone in doubt as who her benefactor was. She even had curtain tie back hooks with the Princes own emblem. - a humorous feature of the dining hall is the peep hole from where His Majesty could view his guests before deciding whether to descend. The building work did not proceed at the pace the couple desired. The English masons were on strike and others had to be imported from Holland. 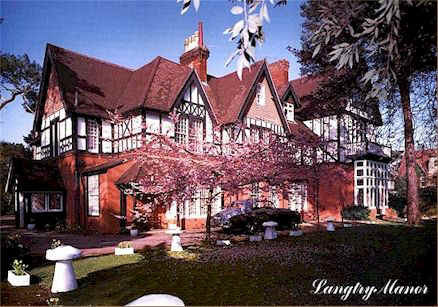 Meanwhile the couple made use of the nearby home of Lord Derby (now the Langtry Lodge).